Comments: Known for their agility and ability to pursue other seabirds until they drop their food, Parasitic Jaegers are highly acrobatic and aggressive during chases. During the breeding season they also eat small birds, eggs and lemmings. Parasitic Jaegers usually show 4-6 white primary shafts. Light and intermediate-phase juveniles have a distinctive cinnamon-toned plumage. Adults show a pale crescent just behind their bills, a peaked head and their central tail feathers are narrow and pointed. 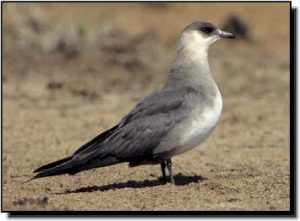 Parasitic Jaegers occur in small numbers or are found only in localized sites within the Great Plains.